Transforming Forest is a work of chamber music inspired by Andy Goldsworthy‘s four art installations in the Presidio of San Francisco, CA. Santa Fe chamber ensemble Montage Music Society commissioned San Francisco-born, Brooklyn-based composer Nell Shaw Cohen to create this piece, which will be premiered in Santa Fe in 2019 and toured as part of an evening length concert program of new chamber music inspired by visual art. We are currently seeking additional venues, collaborative partnerships, and financial support for Transforming Forest and Montage Music Society’s national tour of the accompanying program of music inspired by visual art. For more information, please contact the composer at nell@nellshawcohen and the ensemble at info@montagemusicsociety.com. Read below to learn more about the collaborating artists and their vision for this project. 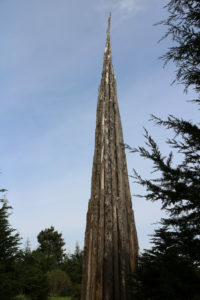 “In Transforming Forest for violin, cello, and piano, each short movement is inspired by one of four site-specific installations created by British artist Andy Goldsworthy in the Presidio of San Francisco: a park and former U.S. Army military fort in the Golden Gate National Recreation Area. These remarkable installations were created by Goldsworthy between 2008 and 2014 using organic, on-site materials such as tree branches and soil. Goldsworthy’s four Presidio installations are transformed through the growth of surrounding vegetation, the elements, the passage of time, and visitor interactions. In my response, I sought to evoke different kinds of transformation connected to each of the four installations. Wood Line is a long, curving line of eucalyptus branches (1,200 feet) placed along the forest floor. Many times, I’ve traced this path with my own feet—walking alongside it, or balancing on top of the branches themselves, the surfaces of which have become smooth from the wear of footsteps over the years. In my response, “Tracing,” a musical motif is continually “traced” through heterophony: picked up by each of the instruments in different tempi and registers. Tree Fall is a tree trunk suspended from the roof of a small, disused military building. 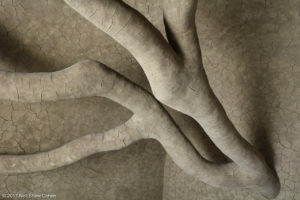 The trunk and roof were covered in wet clay, which developed intricate, cracking patterns on its surface while drying. In “Cracking,” a dark, chorale-like music, conveying the womb-like interior of the building, “cracks” open into a rhythmically dynamic middle section. 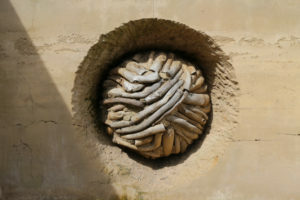 Goldsworthy created Earth Wall by burying and then excavating a sculpture made of eucalyptus branches from within a rammed earth wall at the Presidio Oﬃcers’ Club. A lively third movement, “Excavating,” evokes the spherical tangle of branches at the core of the wall through a building contrapuntal texture. Founded in 2004, Montage Music Society has established itself as a versatile ensemble primarily dedicated to music inspired by visual art. Their projects have resulted in a variety of commissions and performance venues and an acclaimed recording, “Starry Night,” on the MSR label. MMS has been heard at the Library of Congress, Washington DC’s Corcoran Gallery, the Chautauqua Institute and the International Piatti Festival. In 2007 they commissioned composer Andrew List to write a new work based on a centerpiece of the Boston Museum of Fine Arts collection. Funded by a grant from The Argosy Foundation Contemporary Music Fund and Greg DePrince, “Noa Noa, A Gauguin Tableau” is now performed by groups internationally. Montage Music Society is currently touring programs including newly commissioned works by Bruce Wolosoff and Ofer Ben-Amots. Wolosoff’s piece was based on paintings of renowned abstract expressionist painter Milton Resnick, whose centennial was in 2017. View two new documentaries about the evolution of these works at Montage Music Society’s website. Our group has a deep commitment to exploring the possibilities for chamber music to increase appreciation of visual art—as well as reaching museum-based audiences who may not have had prior exposure to New Music. I share Nell Shaw Cohen’s enthusiasm for Andy Goldsworthy’s art and the possibilities for interpreting his work through music. 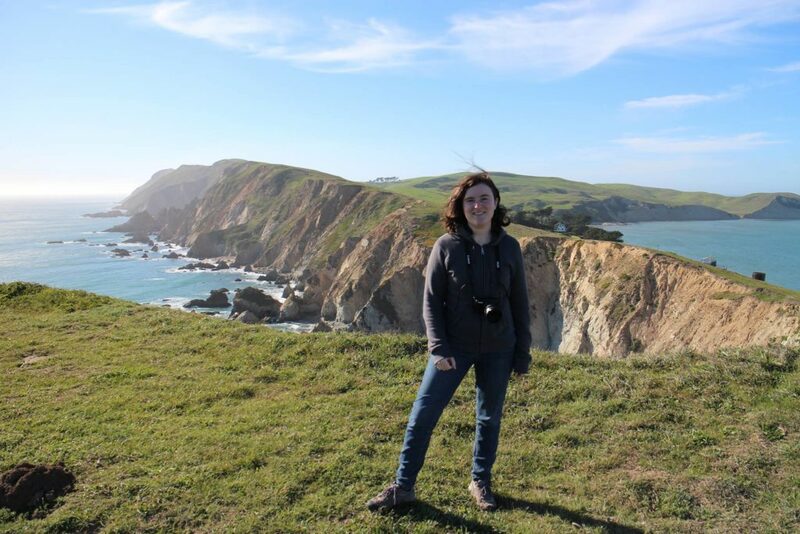 Brooklyn-based, San Francisco-born composer Nell Shaw Cohen evokes landscapes, visual art, and the lives of mavericks in lyrical works for the stage, concert hall, and digital media. Cohen has presented several concerts of music inspired by visual art at the Parrish Art Museum, Harwood Museum, and Peabody Essex Museum, et al. 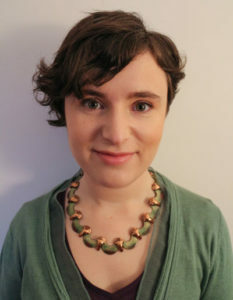 As Founder & Director of LandscapeMusic.org, she advocates for music engaging with landscape, nature, and place. Cohen has been commissioned by Houston Grand Opera to write Turn and Burn, a chamber opera (premiere 2021) for HGOco’s Song of Houston initiative. Her chamber opera Mabel’s Call (2017) received readings in New York City and New Mexico and in 2018, the University of New Mexico presented a workshop production of the full score. Her monodrama The Coming of Spring (2014) was given a workshop staging in NYC. Cohen is an alumna of the Composers & the Voice fellowship with American Opera Projects and the Composer-Librettist Studio at New Dramatists. Sites of urban wilderness in the Bay Area have frequently served as points of reference in my creative process. 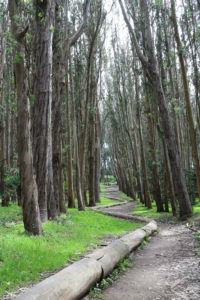 The Presidio’s landscape of eucalyptus and cypress was particularly formative: my childhood home was steps from the site where Goldsworthy’s WOOD LINE was later created. Having made countless pilgrimages to Goldsworthy’s Presidio installations, I feel impelled to formulate a musical response to these powerful places.